3 layers of roses basket 16 red roses & 8 yellow roses total of 24 roses. 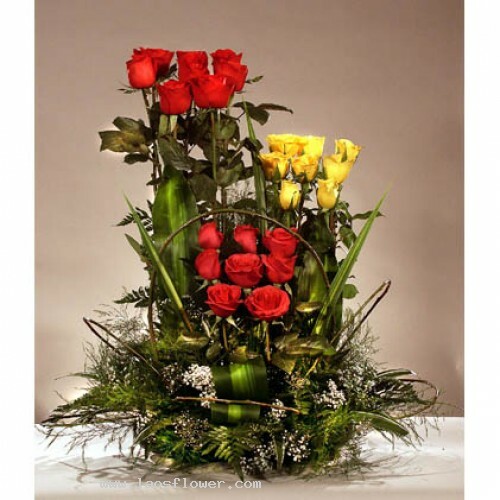 3 layers of roses basket consists of 16 red roses and 8 yellow roses in the total of 24 roses. Arranged in a group of 8 roses accent with white gypsophila, asparagus fern, pandanus and liana. * We can add a beautiful bow for you to send as a gift. The color of the flowers can be adjusted as you like. Occasionally, substitutions may be necessary to create your bouquet due to the availability of certain flowers in various parts of the country. Substitutions may be necessary to ensure your arrangement or specialty gift is delivered in a timely manner. Care is taken to maintain the style, theme and color scheme of the arrangement to ensure that it is as similar as possible to the requested item, using flowers of equal or greater value. If the floral container shown online is not available, a similar container will be used. Specialty gifts may be substituted with another specialty gift of equal or greater value and of similar theme and category. When I see you in the morning. It made my day brighter. There are many thoughts in my head. There are many words I want to say. But I can not find words. They're mixing everything up with my thoughts.